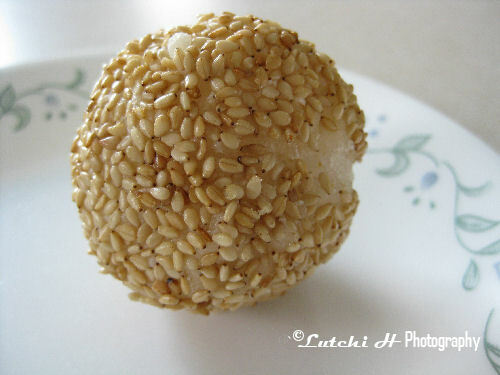 Sesame balls are always one of my favorite desserts in Chinese buffet restaurant. It’s been a long time since I’ve eaten one so I decided to make my own. 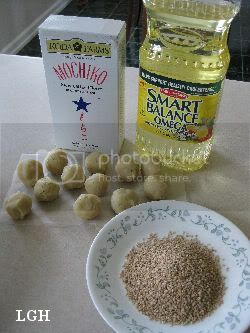 I made these sesame balls a week ago using my prepared mongo paste. I searched for the simplest recipes online and found this one. It’s very easy and quick to follow recipe. 1. 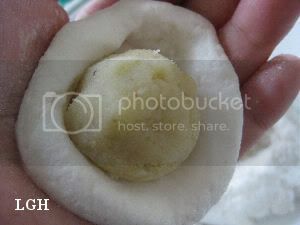 Combine rice flour and water in a bowl, stir to form smooth dough. I used my hand to mix the two ingredients. 2. Knead the dough gently until smooth and easy to handle. 3. Divide the dough into 12 portions. 4. Flatten each piece of the dough. You can either use your fingers or small rolling pin dusted with rice flour. 5. Place each of the prepared filling in the middle and gather the edges of the skin to enclose. Pinch and seal. Roll gently into ball. 7. Heat oil and deep fry until golden brown (3 minutes). Drain and Enjoy! 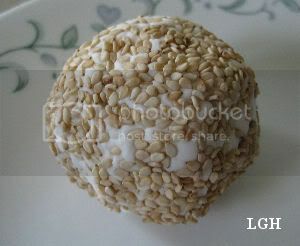 0 Comments On "Sesame Balls"